This month's Mixology Monday theme, "Witches' Garden" (MxMo LXXIII), was picked by Mark Holmes of the Cardiff Cocktails tumblr. Mark's challenge was, "As far back as we can look, the use of fresh herbs have been prevalent in the world of mixed drinks. From the early days of the julep, through Williams Terrington's 19th century Cooling Cups and Dainty Drinks, to Don the Beachcomber's ahead of their time Tiki drinks, fresh herbs have always been at the forefront of mixology. So let's take influence from the bartenders that once ruled the world of mixology, raid your herb garden that too often gets neglected, and start mixing." When reading over the theme's description about the herb garden, I thought about what herbs were already up. Since there was already a mint-themed Mixology Monday, I considered the thyme, chives, catnip, and sage that are already up. The concept of a tequila-sage pairing came to mind, and I set about to find a recipe to match. While I did find a recipe, it was actually created as a rye drink first, and after making both, I felt that the rye version was superior despite my predisposition to the pairing. That recipe was Jacques Bezuidenhout's sage Sazerac, the Sagerac, and after Jacques became the Tequila Partida bartender ambassador, he created the tequila variation. Note: the below recipe has been adapted and scaled down by a third to make it less of a spirit bomb. Lightly muddle the sage leaves with the simple syrup and bitters. Stir with ice and strain into a rocks glass rinsed with Herbsaint. Garnish with a fresh sage leaf. 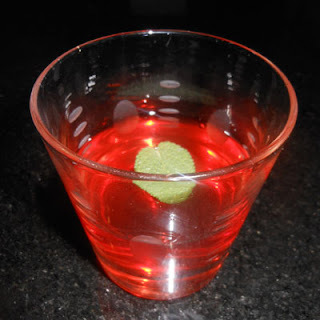 (*) For the Tequila Sagerac, substitute 1 oz Reposado Tequila and 1 oz Blanco Tequila in place of the rye. For the rye version, the sage and the Herbsaint's anise paired up on the nose to generate an almost minty aroma. A sweet, malty sip led into a rye swallow containing minty, anise, and spice flavors; finally, the swallow ended with lingering sage notes. The tequila version was not too much different, but the sip was less distinctive with only a slight aged flavor from the reposado tequila, and the swallow also began with the agave notes. So thank you to Mark conjuring the witches but not having anyone turned into a toad during this month's Mixology Monday. Quite curious as to what other herbs people will select with for this event. Cheers! Generated a few drinking companions, otherwise it's not all that great for the human senses.